Manifold project files in .map format are the native "documents" of Manifold. The File menu provides the usual Windows commands to create new projects, open existing projects, close projects and save projects, all using .map format files. Close the current project (if any) and create a new, blank project. Manifold will prompt to save any unsaved projects and, if the project has not been saved will provide an opportunity to cancel. New projects are named iteratively as Project 1, Project 2 and so on. Close the current project (if any) and open a new, existing project .map file. 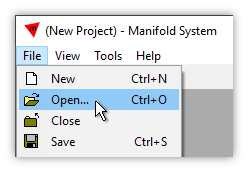 After browsing to and choosing the new .map file to be opened using the usual Windows File - Open dialog, Manifold will prompt to save any unsaved projects and, if the project has not been saved will provide an opportunity to cancel. Save the current project in a .map file. If the project is a new project that has not yet been saved the usual Windows Save As dialog opens to allow specifying a name for the new, saved .map file. If the project has been opened from an existing .map file or if it has already been saved to a .map file the Save will be silent and will simply update the existing .map file. Save the current project in a newly specified .map file using the usual Windows Save As dialog. Drag and Drop to Open - We can open a .map project file by dragging and dropping it from Windows File Explorer onto an open Manifold session. Close - Closing a project without right away without using File - New to create a new project or File - Open to open another project will leave the Manifold desktop with no project underway. Without a project there is not much we can do with Manifold but there are a few things: We can launch the Command Window and write and execute scripts, and we can scan raw text or binary files using the Tools - Scan... commands. Closing without Saving - If a project has only local components then closing it without saving changes made will leave the original .map project file unchanged. However, if we have linked in data sources and we have made any changes to those data sources, in general those changes will have been committed to those data sources at the time we made the changes. Closing the project without saving will not "undo" changes already made to external data sources. For example, suppose we have a project that has both local tables stored in the project and which also has a data source that connects to an Oracle database. Suppose we make changes to tables in the Oracle database and then we Copy data from those Oracle tables and Paste that data into local tables in our project. Now we Close the project without saving changes. What happens? The changes already made to tables in the Oracle database will not be undone, because those have already been committed. However, the changes made to tables saved in the project will disappear, since the next time we open that same project file we will be opening the original version of the project file that has not been altered by saving. See the Example: Closing without Saving topic. Overwrites detected - Attempting to overwrite an existing file in the Save dialog pops open a confirmation dialog, providing options to confirm the overwrite or to save data to a file with a different name, the default.